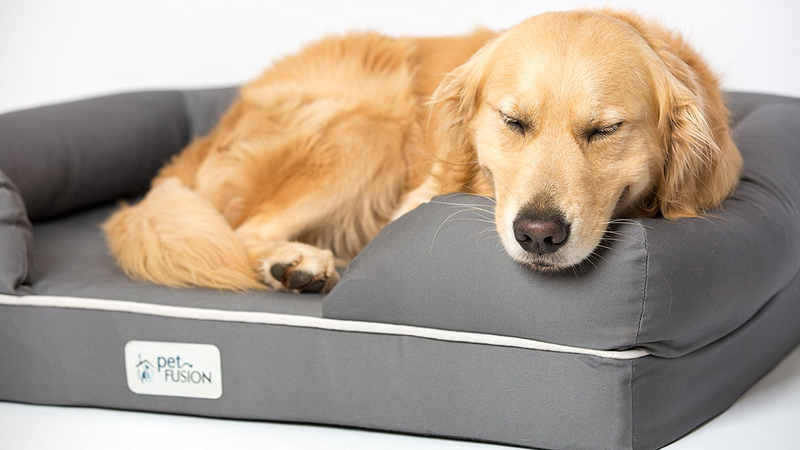 This PetFusion dog bed is one 4-inch hunk of memory foam encased in a waterproof cover. I asked my lovable 5-year-old Lab mix, Ruby to test it out a few days. She’s never one to turn down a nap, most often on the cold tile, but as I set this bed down on the flood next to her, she sniffed and hopped in, leaning on the couch-arm-like bolsters. Unlike the cheaper dog beds I own, all parts of this bed come apart and can be machine washed. When it doesn’t need a full wash, but needs to look less like Cousin It, the almost slick cover allows you to shake off the dog hair - no need to get out the vacuum or lint roller every time. In comparison to the similar Casper dog bed, the PetFusion bed I received is slightly larger all around and about $3o cheaper. Although, the Casper does have the bolsters all the way around for a more bowl-like shape. I’m not sure if Ruby’s afternoon naps on this bed are due to her enjoying the plushy memory foam, or perhaps just liking the smell of something new, but whatever the case, it keeps her and her hair off my pillow.